The global market for touch screen displays has gained a significant momentum over the past few years, thanks to the technological advancements and the subsequent shift of consumers towards the newest technology. The leading manufacturers of touch screen displays across the world are increasingly adopting the latest technologies in order to enhance the customers’ experience. Over the forthcoming years, the popularity of touch screen displays is likely to witness an upswing, thanks to the cost benefits and the ease of operation they offer. Owing to this, the worldwide touch screen display market is expected to be propelled substantially in the near future. However, the increasing prices of raw materials utilized for the production of touch screen displays are projected to hamper the market’s growth in the years to come. 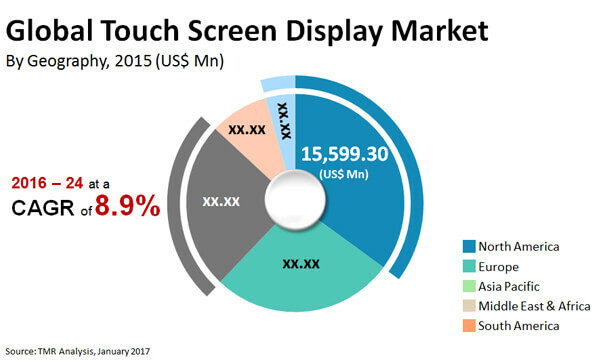 The opportunity in the global market for touch screen displays, which was worth US$44.4 bn in 2015, is projected to expand at a CAGR of 8.90% between 2016 and 2024 and attain a value of US$93.8 bn by the end of 2024. In terms of shipment volume, the market is likely to progress at a CAGR of 10.70% during the same time period. Gas pumps, retail kiosks, public transport kiosks, automated teller machines (ATMs), car wash centers, sports arenas, trade shows and exhibitions, parking terminals, and medical equipment are the main application areas of touch screen displays. Among these, the retail kiosks segment reports a higher demand for these displays than other application segments due to a large number of retail outlets all over the world. As the number of retail outlets continues to increase, the demand for kiosks is also increasing significantly. Retailers are increasingly adopting advanced technologies in a bid to enhance customers’ engagement. As a result, retail kiosks are likely to remain the dominant application segment of touch screen displays over the next few years. The ATMs segment is also projected to register a strong presence in the years to come, thanks to the rising deployment of ATMs in emerging economies in Africa, South America, and Asia Pacific. Geographically, the worldwide market for touch screen displays is spread across North America, South America, Europe, the Middle East and Africa, and Asia Pacific. With a share of 35.0%, North America led the global market in 2015 on the backdrop of technological developments and the high price of electronic equipment. As the region enjoys the presence of a large pool of established players, Researchers anticipate it to remain leading over the forthcoming years. Other regions, such as South America, Asia Pacific, Europe, and the Middle East and Africa are also projected to witness increased demand for touch screen displays in the years to come, thanks to the rise in the deployment of touch screen retail kiosks and ATMs. Displax, Fujitsu Ltd., 3M Co., Samsung, LG Electronics, American Industrial Systems Inc. (AIS), and Panasonic Corp., are some of the leading players operating in the global touch screen display market. Touch screen displays use resistive touch, capacitive touch, surface acoustic wave, and infrared technology to act as an interface between service providers and end-users. Touch screen displays act as an interaction point between various service providers and their end-users and help in enhancing and simplifying user experience besides reducing labor costs for service providers. Touch screen displays are majorly deployed in retail outlets, gas pumps, automated teller machines (ATMs), tradeshows and exhibitions, public transit stations, and in sports arenas. The global touch screen display market has been showcasing considerable growth potential owing to the rise in need for reduction of growing labor costs. Reduction of labor costs is a growing concern for both large and small organizations. The deployment of touch screen based machines eliminate the need for labor in such cases. Additionally, as a result of being habituated to using touchscreen smartphones, users find touch screen displays and kiosks user-friendly. This aids in enhanced user experience owing to their familiarity with the technology. This is significantly contributing towards the growth in demand for touch screen displays across industry verticals. Also, technological advancements have led to the replacement of traditional interactive displays with touch screen displays, thus increasing the demand for touch screen displays. However, the rising costs of raw materials due to their sparse availability is expected to hinder the growth of the global touch screen display market during the forecast period from 2016 to 2024. Nonetheless, the introduction of multi-touch technology in touch screen displays and customizable touch screens is expected to offer considerable growth opportunities during the forecast period. This research report provides an in-depth analysis of the global touch screen display market based on application, and geography. Furthermore, the report provides complete insights into different application of touch screen displays, which includes ATMs, parking terminal kiosks, kiosks at trade shows and exhibitions, public transport kiosks, self-service gas station kiosks, retail kiosks, touch screen kiosks in sports arenas, touch screens in medical equipment and devices. The report analyzes each of these segments for the various geographies considered under the scope of the study. Based on geographical regions, the report segments the global touch screen display market into North America, Europe, Asia Pacific, Middle East & Africa (MEA), and South America, which are analyzed in terms of revenue generation. North America is further segmented into the U.S., and Rest of North America, while Europe is divided into the U.K., Germany, France, Spain, Italy and Rest of Europe. Asia Pacific has been subdivided into Japan, China, India, South Korea, and Rest of Asia Pacific. MEA has also been further segmented into GCC countries, South Africa, and Rest of MEA, while South America has been subdivided into Brazil, Argentina, and Rest of South America. The report further provides an analysis of the factors that drive and restrain the growth of the touch screen display market. It discusses the prevailing market trends, prospective growth opportunities, and major strategies increasing the popularity of the global touch screen display market. It provides market estimates and forecasts for all the segments in terms of revenue. Also provided in the report is the market share of key players. Based on segment revenues, the market share of key players have been estimated for 2015. The report also provides industry evolution, value chain analysis, and Porter’s Five Forces Analysis for the global touch screen display market. Major business strategies adopted by key players, their SWOT analysis, and competition matrix have also been identified in the research report. The key market players profiled in this study include Fujitsu Ltd., UICO, The 3M Company, American Industrial Systems Inc. (AIS), iNEXIO Co., Ltd., LG Electronics, Displax, Panasonic Corporation, and Samsung Electronics among others.